I am officially back my friends and I know it's been a long time. Don't get me wrong, it felt nice to disconnect for a bit but it definitely wasn't planned for and it was for way too long. I needed to take some time off to spend it with family. Although I believe in hard work and being an overachiever, a sudden and very unfortunate family matter led me to shift gears for a bit. Everything is slowly falling into place but it's about time that I got back to doing what I love the most. There are some major changes coming your way and I can't wait to share. Studs and Sapphires will soon be your go-to for fashion, beauty, and everything else in between. I can't reveal too much but I hope you stick around to find out more. For this high impact look, start off with silhouettes first when styling pieces that you want tailored to your body. If you choose a top that it loose-fitting or has some volume, make sure you keep the bottoms more form framing. I love any off the shoulder detail and it's such a strong trend this spring and summer season. Have fun with this detail! 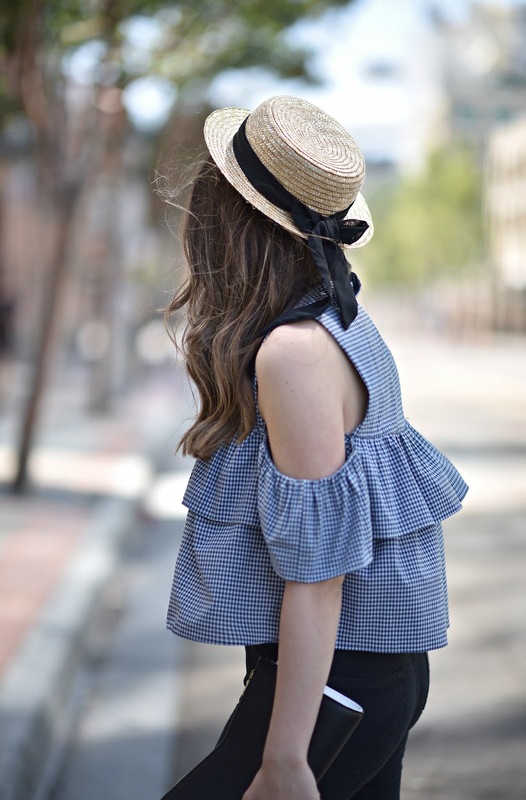 I opted for simple black jeans because the focal point of this entire look is the gingham ruffle and shoulder detail. Don't forget to accessorize! Your outfit will quickly feel complete with a statement piece, such as a straw hat. Fabulous off the shoulders top! You look so romantic and stylish Lillian! Such a cute hat, looking lovely as always! Can you link to where you got the top? Unless I'm missing it somewhere?